Salem Wolves are known for their blend of bombastic, arena rock ready rock n' roll/punk anthems. You would assume that when their lead singer, Gray Bouchard, released a solo album, it would be more on the quieter end. You'd be right with that assumption, but this isn't your typical rock/punk frontman releasing an album of introspective acoustic songs. 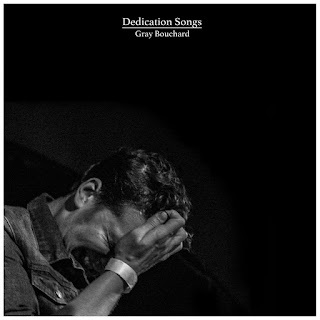 Instead, Dedication Songs still has a large sound of less heavy but still big, earnest songs. It's almost as if Billy Bragg took over U2 for an album in the 90's. "Nothing From Nothing" starts off the album with some quiet music box tinkering but builds into this huge power ballad. "You're No Better" might be the angriest power ballad of all time, with it's jerky rhythm and Pinkerton style confessional vibe. "Chasing After Honey" has a distinct 80's pop vibe, like a more rootsy Rick Springfield. There's enough of Salem Wolves's make up on Dedication Songs to satisfy their fans, but Gray Bouchard reaches out enough to bring in a whole new audience. This album can't be recommended enough. You can listen to the album opener, "Nothing From Nothing," below. Dedication Songs is available now via Bandcamp. For more on Gray Bouchard, follow him on Facebook.